A group of Crossed plague survivors off the Scottish coast defend their isolated island and pretend that they are safe from the gleeful violent misery of the Crossed. Shaky has manipulated his fellow castaways into sending him away from the faux safety of the camp and into the ravages of the Crossed world. His desire to be rid of the infighting and petty squabbling puts him in a much deadlier world but his ultimate goals go beyond the survival and denial of those living on the Coast of Cava. This is his story, the search for meaning in in a world filled with homicidal maniacs. There is no hope. 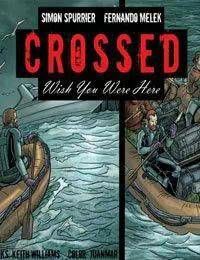 There's only the Crossed.